Brittany Spaniel Characteristics: The energetic and congenial Brittany Spaniel is a breed of medium sized dog, classified as a member of the Sporting Dogs Group. The Brittany Spaniel, is characterized by its compact, leggy appearance with a rounded, slightly wedge shaped head and fearless expression. Other characteristics include dark or amber eyes; heavy, expressive eyebrows, short, triangular-shaped ears; a short, 4 inch tail and a smooth, powerful gait. The temperament of the Brittany Spaniel can be described as Agile, Attentive, Adaptable. The coat type of the dog is described as dense, short/medium coat in assorted colors. Due to its characteristics and qualities, the Brittany demonstrated the desired traits of Pointer and Retriever Dogs and is known by its nick name the "Epagneul Breton". The origin of the Brittany Spaniel breed was in France where it was developed in the 1600's. Brittany Spaniel Breed Group and Dog Type - Sporting Group: The Brittany Spaniel is one of the many breeds of dogs that belong to the Sporting Dog Group. The Brittany Spaniel was officially recognized by the American Kennel Club (AKC) in 1934. Other names for the Brittany Spaniel: The Brittany Spaniel is known by the nickname of the "Epagneul Breton". Other names for this breed include the Brittany Spaniel, Brittany Wiegref and Epagneul Breton. Origin of the name Brittany Spaniel: The origin of the name "Brittany" derives from a region in north-west France where the Brittany Spaniel was developed. The Brittany Spaniel, is now simply referred to as the Brittany. Brittany Spaniel History and Origin: The country of origin of the Brittany Spaniel breed was in France during the 1600's. The ancestors of the Brittany Spaniel are believed to be the Welsh Springer Spaniel, to whom bears a striking resemblance and the English Setter. During the 1600's the wool trade was extremely lucrative and many English and Welsh weavers, cloth makers and dyers migrated to Brittany to capitalize on the booming textile industry in Brittany. The migrants took their dogs with them, these were cross bred with French spaniels and the Brittany Spaniel emerged as unique hunting dogs, often used by poachers and French peasants, who hunted for pheasant, snipe, red legged partridge and forest grouse on the large French estates. The obedient Brittany Spaniel became popular with the French nobility due to its unusual hunting skills and are depicted on tapestries and paintings dating from the 17th century. The hunting style of the Brittany Spaniel was more like that of a pointer or setter, whose main purpose was to locate game, than that of a spaniel, which was used to flush out quarry. The tough, Brittany Spaniel was a close working pointer with a natural retrieving ability that gave the dogs the speed and agility to cover a lot of ground. The dense skin and coat of the Brittany Spaniel could resist scratches and tears caused by prickly shrubs and brambles in thick cover. The characteristics of the Brittany Spaniel made them ideal dogs to make the successful transition to the role of Gun Dogs, as the use of firearms in hunting increased. In the 1900's British sportsmen went across the English Channel to Brittany in France to hunt the plentiful woodcock and other game. They were accompanied by their English Pointers, which they left in France due to 1901 Quarantine Law. 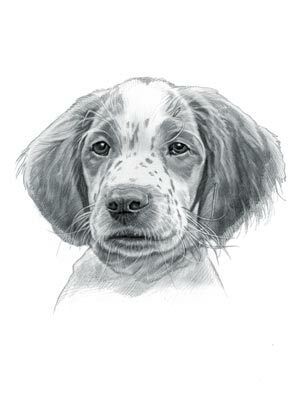 These setters were cross bred with the Brittany Spaniel, further evolving the breed and strengthening its pointing ability. In 1907 a French lawyer named Arthur Enaud organized the Club Epagneul Breton-France to nurture, develop and promote the breed and publish the Brittany Spaniel breed standard. Following WW1 (1914 - 1918) the Brittany Spaniel was exported as a Bird Dog to the United States and the Brittany Spaniel was officially recognised by the American Kennel Club (AKC) in 1934. Brittany Spaniel Modern History: The modern history of the Brittany Spaniel moved on and in 1982 the American Kennel Club (AKC) dropped the misleading name "spaniel" from this predominantly pointing breed. The dog is now referred to as simply the "Brittany". Brittany Spaniel Height: The Brittany Spaniel breed is classified as a medium sized dog. The height to the shoulder of a male dog is 19-20 inches (47-52 cm). The height to the shoulder of a female dog is 18-20 inches (46-51 cm). Brittany Spaniel Weight: The weight of the male in the medium sized Brittany Spaniel is 30-40 lbs (14-18 kg). The weight of the smaller female dog is 30-40 lbs (14-18 kg). Brittany Spaniel Coat Type: The coat type is described as dense, short/medium coat. Brittany Spaniel Coat Colors: The colors of the Brittany Spaniel breed consist of assorted colors consisting of Orange & White, Liver & White, Black & White, Piebald and Tri-color. The roan coat of a main color is thickly interspersed with hairs of another color, typically black mixed with white. The word "liver" signifies any shade from yellow to brown. Brittany Spaniel Grooming - MODERATE Grooming Needs: The dog grooming needs of the Brittany is not extensive and therefore categorized as Moderate in order to maintain a healthy coat, reducing the risk of skin infections. The modest grooming needs of the Brittany is considered to be mid-maintenance requiring weekly brushing and combing. Dog Grooming Requirements should include bathing the dog on a monthly basis and making regular inspections of the teeth, eyes, nails and ears. Brittany Spaniel Litter Size: The litter size of the Brittany Spaniel breed ranges from 1 - 11 puppies, average 6. Brittany puppies for sale can be obtained reputable breeders and from rescue centers. The cost of Brittany puppies varies depending on location, pedigree history and the breeder. Brittany Spaniel Temperament and personality: The temperament and personality of the popular Brittany Spaniel breed is described as Energetic, Agile, Attentive, Adaptable and Congenial. Brittany Spaniel Exercise Requirements: The exercise requirements of this breed are moderate. The Brittany Spaniel requires regular daily exercise consisting of about one hour every day. This medium sized dog has a smooth, powerful, strident gait with strides of a moderate length requiring a steady walking or jogging speed by the owner to meet the dogs exercise requirements. If the dog has more energy than you do, then teach your pet to play ball in a chase and catch game. Brittany Spaniel Diet: A fully grown Brittany should be fed twice a day. A diet consisting of a premium dog food can be balanced with fresh food eaten by the family. The question is What Can Dogs Eat?. Check out our comprehensive list of what dogs can and what dogs cannot eat. Brittany Spaniel Health Problems: Potential health problems of the Brittany Spaniel breed have shown no recurring problems. Resolving health problems can prove to be expensive and it is always wise to obtain pet insurance or dog health insurance when buying a dog. Is the breed said to be Hypoallergenic? Answer: No. Brittany Spaniel Lifespan: The life expectancy of dogs vary according to the size, breed of dog and any serious health problems. The typical lifespan of the Brittany is 11-15 years. Brittany Male Dog Names: Male names are most often chosen to reflect favorite names of the owner or the strength, size, coloring and country of origin of the breed. To give you some inspiration regarding good male names our small selection might be of help with naming boy dogs. Our top male dog names are: Etienne *** Fabien *** Chaos *** Jett *** Jinx *** Buster *** Cody *** Marcel *** Festus *** Rave *** Napoleon. Brittany Female Dog Names: Female names tend to be softer, prettier and reflect the temperament of girl dogs. Our top choice of good female names are Suzette *** Arlette *** Baby *** Cleo *** Honey *** Bernadette *** Cherine *** Gracie *** Sammy *** Rosie *** Therese *** Veronique.